Ferrari posted strong third-quarter earnings. Ferrari disappointed on full-year guidance for 2018. Ferrari announced third-quarter core earnings on Monday. They rose almost 5%, helped by positive performance from across its regions and strong sales of 8-cylinder models, Reuters reported. 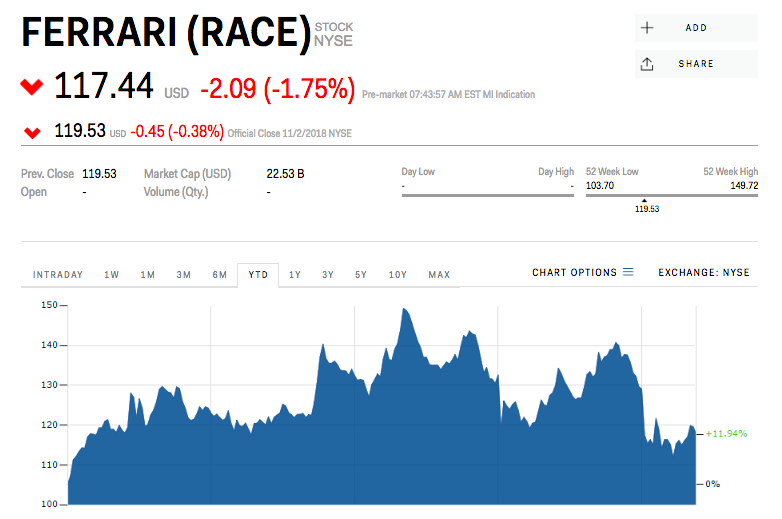 But Ferrari stock declined in pre-market trading Monday, down almost 2% to $117.44. The automaker did not make any statements about improved full-year guidance. Year-to-date, Ferrari shares are up over 11%, bu down from their trading highs.